ACTION Mental Health, a charity which this year celebrated 50 years working in Downpatrick, have formally launched their new Men’s Shed Project during World Mental Health Week 2013. The organisation was awarded a grant from the Big Lottery Fund’s “Reaching Out: Connecting Older People” programme and have used it to establish Men’s Shed projects in Downpatrick, Antrim and Enniskillen. 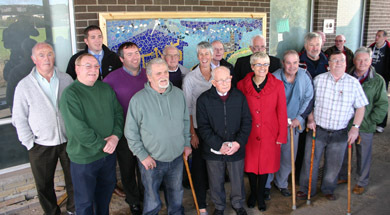 South Down MP Margaret Ritchie at the launch of the Downpatrick men’s shed with a group of ‘shedders’. Men’s Shed Downpatrick is a place for men aged 60+ to meet and discuss issues, share skills and explore new interests, with the aim of promoting their own health and development and putting something back into the community. It is a larger version of the typical man’s garden shed in their garden. A great day was had by all at the launch. A healthy lunch was prepared by the local Downpatrick shedders. John Evoy the CEO of the Irish Men’s Shed was on hand to unveil the newly created mosaic to celebrate the event. Other shedders from Dundalk, Fermanagh, Belfast, Antrim and Armagh were also in attendance along with South Down MP Margaret Ritchie and key stakeholders in the Downpatrick area. Men’s Shed is actively looking for local shedders and volunteers to join the shed. 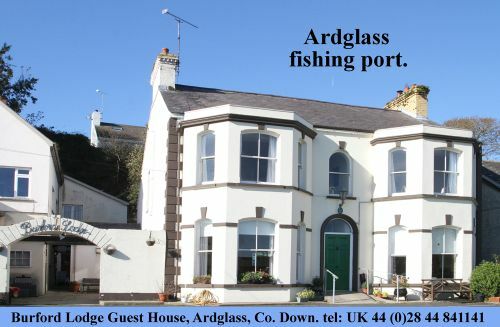 Activities undertaken at present include joinery, gardening, woodturning, art, cookery and IT. Eoin McAnuff, Project Coordinator said: “Members of Men’s Sheds (Shedders) can come from all walks of life – the bond that unites them is that they are men with time on their hands and they would like something meaningful to do with that time. or call Hazel Wilson on 07885 407 094.